Everybody has a moment when they would like something sour, crunchy, or different. How about sauerkraut? With this wholesome dish you could treat your friend and a foreign guest. From ancient times sauerkraut was one of the favourite Slavic dishes and was consumed during the cold period of winter and in spring when organisms needed extra vitamins and minerals – the time of their deficit. The recipe is quite easy. The cabbage is washed, cut or chopped, crushed with salt to acquire its natural juice, add carrots. Put our cabbage in barrel with the whole leaves at the bottom. Cover the cabbage with a heavy load on top. Let the natural process of fermentation take over at the room temperature. The whole process should last about 5 days. The German recipe is slightly different and involves high temperatures. – Better use glass or enamelled container, plastic is not recommended. – For the weight on top you could use a stone or dish with water. – After the process of fermentation our sauerkraut should be kept at 0°C. 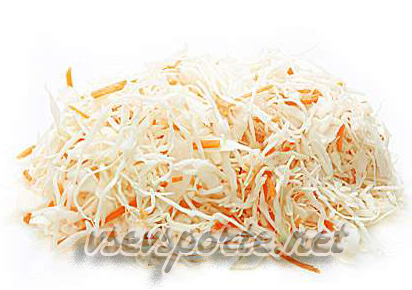 – Do not freeze sauerkraut because its nutrients and crunchiness would get lost. – During fermentation process the whole mass should be kept under the brine otherwise the cabbage will get dark and vitamin C will be destroyed. Sauerkraut contains the most valuable components that our organism needed: loads of vitamins, micro- and macro elements, enzymes and fibre. Consumption of only 200 grammes of it is enough to cover your daily dose of vitamin C. There are also vitamins A, B1, B2, B3, B6, P, K, U.
Vitamins of series B regulates metabolism. It helps maintain healthy stomach and duodenum. There are also elements that naturally prolong storage of the product. Vitamins and minerals contained in sauerkraut are known to stimulate male potency. For ladies sauerkraut would be a great addition with the fight against nausea and vomiting in early pregnancy. Some people notice that this dish helps with hangovers as well. It is not recommended to people with increased acidity of gastric juice, renal failure, pancreas and hypertension.